Fill this gorgeous Tropical Terrine with pineapple gelatin, crushed pineapples and more. Encase the terrine in ladyfingers to make it extra special. Line bottom and sides of 9x5-inch loaf pan with plastic wrap. Stand enough ladyfingers, cut sides in, to evenly fit along sides of pan. Stir boiling water into gelatin in large bowl at least 2 min. until completely dissolved. Stir in pineapple with its juice and the water. Refrigerate about 1-1/4 hours or until slightly thickened (consistency of unbeaten egg whites). Gently stir in 2 cups of the whipped topping and the oranges. Spoon into prepared pan. 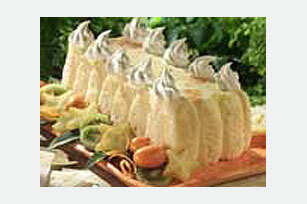 Arrange remaining ladyfingers, cut sides down, evenly on top of gelatin mixture. Refrigerate 3 hours or until firm. Place serving plate on top of pan. Invert, holding pan and plate together; shake gently to loosen. Carefully remove pan and plastic wrap. Top with remaining whipped topping. Store leftover dessert in refrigerator. Substitute 2 pkg. (4-serving size each) JELL-O Island Pineapple Flavor Gelatin for the 1 pkg. (8-serving size) gelatin. Do not use fresh or frozen pineapple, kiwi, papaya or guava juice. Gelatin will not set. Garnish with pineapple leaves, peeled kiwi slices and star fruit slices just before serving.